New Jewish housing project in eastern Jerusalem finally gets off the ground – though not without loud Arab protests that required police presence. A new Jewish housing project in eastern Jerusalem, just about a half-kilometer from Ammunition Hill outside Ramat Eshkol has finally gotten off the ground – though not without loud Arab protests that required a police presence. 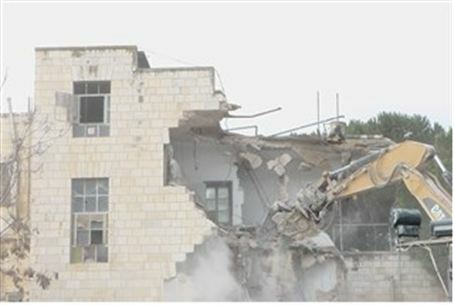 The old Shepherd Hotel, in the Shimon HaTzaddik-Sheikh Jarrah neighborhood was brought down today (Sunday) by bulldozers in preparation for the construction on the site of a new, 20-unit housing project. The hotel was the former home of Haj Amin Al-Husseini, the mufti of Jerusalem who engineered murderous riots against Jews in 1929 and 1936. During World War II, Husseini met with Hitler and mobilized Muslim support for the Nazis among Muslims. "It is very symbolic," said Daniel Lurie, Executive Director of the Ateret Cohanim Association, "that the home of this former Nazi sympathizer is being razed – even so many years later – to make way for Jews to return to Jerusalem. Watching the hotel go down, Lurie said, "This building is a symbol of genocide; Husseini was practically a full-fledged Nazi; the British arrested him for starting pogroms in the 1920's, and he established on his own a unit that murdered hundreds of thousands of Jews in Yugoslavia during World War II… The Jews are now returning to our natural home; no one can claim that Jerusalem is not Jewish, and this particular spot is in the heart of Jerusalem. Some Arabs live here, but it is a Jewish area; Simon the Just is buried here, Jews live right below, the Police Headquarters are located nearby. The natural process of the Jews returning home is continuing, and with G-d's help it will pick up even more steam." The Shepherd Hotel was purchased by Dr. Irving Moskowitz of the U.S. back in 1985. His plans to build Jewish homes there met up with various bureaucratic and political obstacles, but now – 25 years later – they have begun taking on physical shape and form. Moskowitz and his wife Cherna also purchased the land on which the Ma'aleh HaZeitim complex continues to be built, opposite the Mount of Olives. Responding to international criticism, and especially from U.S. President Barack Obama regarding Jewish construction in the Shimon HaTzaddik area, Mrs. Moskowitz wrote in September 2009 that this "seems to be a continuation of a 2,000-year-old habit of Jews being told where they can and cannot live. This spanned from the ghettos of medieval Europe, to severe zoning restrictions in czarist Russia and finally to the edicts of Nazism where we were eventually told that we could not live at all." She added that "reclaiming the land of our country" is "part of the Jewish tradition." Radical-left Peace Now, which objects to a Jewish presence in Judea, Samaria and eastern Jerusalem came out strongly against today's activity at the Shepherd site, as did Palestinian Authority negotiator Saeb Erekat and MK Dov Henin of the Jewish-Arab Hadash party.